All of those famous grapes grown in France, Italy, Australia, Argentina and California are the ones most people seek out. They are the names you know by heart: Cabernet Sauvignon, Chardonnay, Sangiovese, Shiraz, Malbec, and Zinfandel. It turns out they don't fare too well up here in our cooler climate. One of the varietals that does grow well in the region is Baco Noir. The grapes in this bottle come from winemaker Steve Casscles' home vineyard in Athens. They are hand picked, hand pressed, and aged in French oak barrels. Three lots are produced and the two that will work best together are blended into this reserve bottling. A whopping 70 cases are made. Kendall-Jackson probably spills more wine than Hudson-Chatham produces. You can taste it for yourself at the winery in Ghent. Or you could belly up to their table at the Schenectady Greenmarket and try several of their wines in little paper cups. 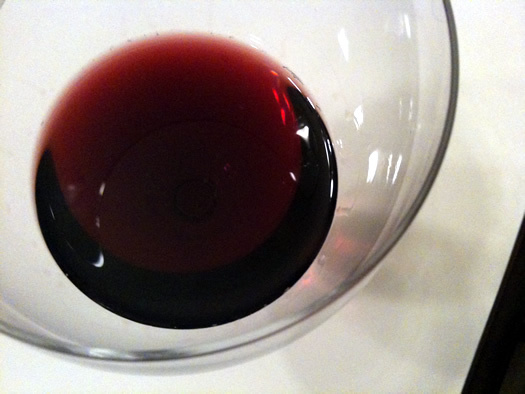 In wine circles there is a fancy and difficult to pronounce French word: Terroir. What the word implies is that every wine producing region has its own specific taste. So what does this region taste like? Using the Baco Noir Reserve as a guide, we are fruity, tart and restrained. Although Carlo De Vito, owner of the Hudson-Chatham Winery and author of East Coast Wineries, would say the larger character of our regional wines are defined by being soft and approachable. 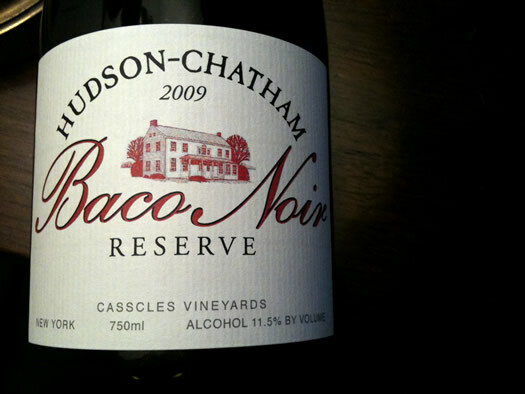 The Hudson-Chatham Winery's Baco Noir Reserve is a clear and bright garnet. To me it smells of tart red fruit, and offers the impression of strawberries and tart cherries. I also get a little bit of sweet barnyard hay. On the tongue it is less fruity, but it's filled with bright acidity and enough tannin to give it some structure. The finish leaves me with a lingering notion of cranberries. This wine would go well with something that was rich and did not have a lot of competing flavors, like a simple roast chicken, or bacon wrapped pork loin. Hudson-Chatham produces many other wines from fruit grown around the state, but their Seyval Blanc is also locally grown. Their wines range in price from $12 to $24 a bottle. 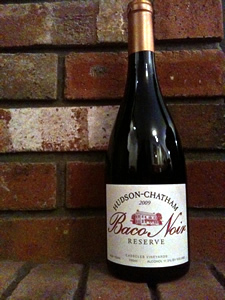 If you want to bring back a bottle of the Baco Noir Reserve it will set you back $20.50. Now get to the winery and start sniffing and sipping. Wow! Thanks for posting about this winery; I'd never heard of it. Sounds like a fun day trip! I'm not 100% sure but I think they also sell this wine at Goold's Orchard... anyway I tasted a Baco Noir when I was there, and they sell a lot of wines from the region (not just the Brookview stuff). If it's the same wine, I can vouch that it's delicious. Full of fruit and spice. It was nice to read your piece about Baco Noirs. Many of the Finger Lakes region wineries make very nice Baco Noirs, and my husband and I have enjoyed them for years. The Riesling and Blanc de Blanc (sparkling white wine) are really good. They also sell "Lindenwald White", named after the home of our 8th President, and a great hard apple cider. Nice post Dan! Learn something new everyday. Amazing color for such a cool climate wine. I will have to put this on my short list. Thanks! There is something for everyone.The winery has a selection of cheese that is made from nearby farms that's delicious. My favorite the hard apple cider and the Blanc de Blanc white..The Baco Noir is the most interesting wine there. Always a pleasure to visit their winery in Glent!!! I received several bottles of the old-growth Baco Noir as a gift, and it is a fantastic wine--easily the best New York product I have ever experienced. The notes the author alludes to are all there; they only deepen if the wine is permitted to breath for about twenty minutes after uncorking. I have tried several other of the HC wines, but this is easily the best--and the one worth seeking out.